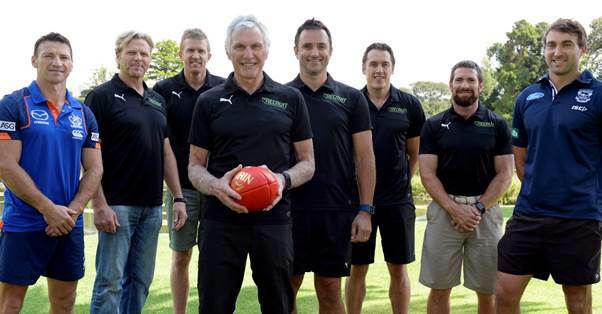 Production has commenced on the second season of FOX8’s hit AFL competition series THE RECRUIT, with AFL legend Mick Malthouse leading the search for Australia’s next sporting hero. Produced by McGuire Media, THE RECRUIT is a 10-part reality television series that follows a group of “Recruits” who live and play together as a team, while at the same time competing against each other for a life-changing prize – a guaranteed place on an AFL list. Renowned for his record-breaking coaching career, Mick takes on the role of Head Coach for the second series. He will be joined by former Hawthorn champion and FOX FOOTY commentator Ben Dixon as Assistant Coach, Port Adelaide’s world class fitness guru Darren Burgess as High Performance Coach; and accomplished sports administrator Leigh Russell as Mind Coach. Over the next 10 weeks, these sporting heavyweights will put the Recruits through their paces, both physically and mentally, in order to discover a player who is truly worthy of a place on an AFL team. Additional guest stars will appear throughout the series imparting knowledge and skills. AFL stars Jason Akermanis, Corey Enright, Dustin Fletcher, Brent Harvey, Anthony Koutoufides and Fox Footy’s Dermott Brereton, who between them have won 15 Premierships and played nearly 2000 games, were on site to give The Recruits some encouragement for their very first challenge. While Melbourne’s Etihad Stadium is the formal home of THE RECRUIT, many of the challenges and football games will be filmed at various locations across the country. The series will culminate in a live finale in which an AFL Draft will be held, with the winner signing a contract with one AFL club. THE RECRUIT is produced by McGuire Media exclusively for Foxtel and will air on FOX8 later this year.